Your day-by-day itinerary now includes Santa Barbara Museum of Natural History Sea Center as well as Santa Barbara Zoo. On the 17th (Sat), tour the pleasant surroundings at Santa Barbara Zoo, take in panoramic vistas at Santa Barbara County Courthouse, observe the fascinating underwater world at Santa Barbara Museum of Natural History Sea Center, then admire nature's wide array of creatures at Santa Barbara Zoo, and finally take a leisurely stroll along Stearns Wharf. To find where to stay, traveler tips, other places to visit, and more tourist information, use the Santa Barbara vacation planner. Murrieta to Santa Barbara is an approximately 3-hour car ride. Traveling from Murrieta in August, you will find days in Santa Barbara are slightly colder (76°F), and nights are about the same (60°F). On the 19th (Mon), you'll travel to Monterey. Monterey is a city in the U.S. 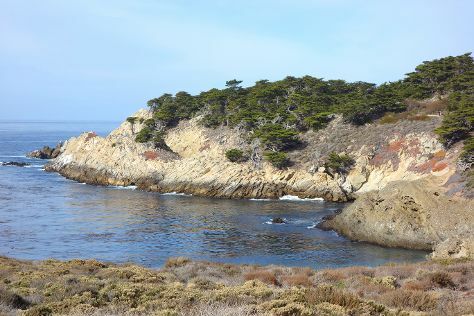 Kick off your visit on the 19th (Mon): admire nature's wide array of creatures at Monterey Bay Aquarium and then kick back and relax at Point Lobos. To find ratings, maps, where to stay, and tourist information, refer to the Monterey itinerary planner . Traveling by car from Santa Barbara to Monterey takes 4.5 hours. Alternatively, you can fly; or do a combination of flight and shuttle. When traveling from Santa Barbara in August, plan for little chillier days in Monterey, with highs around 70°F, while nights are about the same with lows around 57°F. Wrap up your sightseeing on the 20th (Tue) early enough to travel to Redwood National Park. Start off your visit on the 20th (Tue): hike along Trillium Falls Hike. To see reviews, photos, maps, and more tourist information, you can read our Redwood National Park road trip planning app . Use the Route module to find suitable travel options from Monterey to Redwood National Park. Traveling from Monterey in August, expect Redwood National Park to be slightly colder, temps between 64°F and 52°F. On the 21st (Wed), wrap the sightseeing up by early afternoon so you can travel to Lake Oswego. Lake Oswego is a city in the State of Oregon, primarily in Clackamas County with small portions extending into neighboring Multnomah and Washington counties. Family-friendly places like Bonneville Hatchery and Evergreen Wings & Waves Waterpark will thrill your kids. Get out of town with these interesting Lake Oswego side-trips: Wine Tours & Tastings (in Newberg), Vista House (in Corbett) and Evergreen Aviation & Space Museum (in McMinnville). There's much more to do: steep yourself in history at Columbia River Highway, delve into the lush surroundings at Camassia Natural Area, and do a tasting at Domaine Serene. To find photos, other places to visit, where to stay, and more tourist information, you can read our Lake Oswego trip tool . Drive from Redwood National Park to Lake Oswego in 7.5 hours. Alternatively, you can fly. When traveling from Redwood National Park in August, plan for much hotter days in Lake Oswego, with highs around 85°F, while nights are about the same with lows around 57°F. Finish your sightseeing early on the 25th (Sun) so you can travel to Yakima. Yakima is a U.S. You'll visit kid-friendly attractions like Mount Adams Wilderness and Second Beach. There's still lots to do: take an in-depth tour of Yakima Valley Museum, tour the pleasant surroundings at Cowiche Canyon Trail, explore and take pictures at Johnson's Orchards, and sample the tasty concoctions at Bale Breaker Brewing Company. You can plan Yakima trip in no time by asking Inspirock to help create your itinerary. Traveling by car from Lake Oswego to Yakima takes 3.5 hours. When traveling from Lake Oswego in August, plan for a bit warmer days in Yakima, with highs around 92°F, while nights are about the same with lows around 57°F. Finish your sightseeing early on the 28th (Wed) so you can travel to Crater Lake National Park. Start off your visit on the 28th (Wed): explore the wealth of natural beauty at Crater Lake National Park. Get ready for a full day of sightseeing on the 29th (Thu): cruise along Rim Dr, head off the coast to Wizard Island, then tour the pleasant surroundings at Pinnacles Trail, and finally look for all kinds of wild species at Rogue River Gorge Viewpoint. For photos, maps, other places to visit, and tourist information, you can read our Crater Lake National Park online itinerary maker . Drive from Yakima to Crater Lake National Park in 6.5 hours. Alternatively, you can fly. In August, daytime highs in Crater Lake National Park are 93°F, while nighttime lows are 60°F. Finish up your sightseeing early on the 29th (Thu) so you can travel back home. Start off your visit on the 30th (Fri): contemplate in the serene atmosphere at Cathedral of the Blessed Sacrament, then admire all the interesting features of Capitol Park, then examine the collection at California State Railroad Museum, and finally see the interesting displays at California State Capitol Museum. Here are some ideas for day two: see the interesting displays at Old Sacramento, then make a trip to Tower Bridge, and then explore the world behind art at Crocker Art Museum. For photos, maps, reviews, and more tourist information, read our Sacramento trip itinerary website . Traveling by combination of car and flight from Crater Lake National Park to Sacramento takes 6.5 hours. Alternatively, you can drive; or do a combination of car, flight, subway, and train. Expect a daytime high around 91°F in August, and nighttime lows around 60°F. Finish up your sightseeing early on the 31st (Sat) so you can travel back home.